Wonderful two bedroom (plus loft), two bathroom condo on St. Augustine beach at the edge of Crescent beach. Top floor end unit - in gated Beachside community with pool and private beach access. Ocean view from living room and nice views over the western horizon from balconies. Our building is on the dune and there are stairs to get to the unit. Very private, two balconies w/ small table & chairs, recently remodeled with all new furniture & vaulted ceiling. Free wireless internet. We've equipped the condo with everything you need to enjoy your time at the beach. Beach chairs, towels, noodles & pool toys, even a cooler. Our condo has 2 TVs (flatscreen in LRM), DVD/VCR player w/movie library, Playstation 2 w/ several games. Iron & ironing board. Our fully equipped kitchen has dishwasher, microwave, washer and dryer, coffee maker, blender, espresso/cappuccino machine, even an ice cream maker. Master suite has queen-sized bed, TV and a private bathroom. Second bedroom has queen size bed, and a loft with two single beds. LRM has sofa/sleeper. Nice pool area with deck seating in the sun and shade, picnic area and gated walkway to beach. 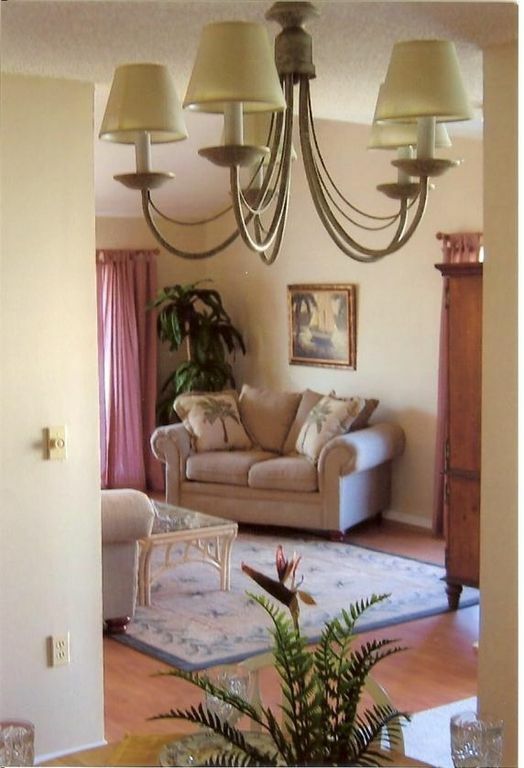 Great condo with a wonderful location and everything that you could possibly need. Beach was close, clean and not at all crowded. Very easy to reserve and get info from owner. Nice lodging but picture is deceiving with no view of beach from balcony facing A1A! Everything is just as described. I would add that there is a nice grassy area next to the condo where you could pull up a chair to enjoy ocean views pretty handily. We went with another family who rented in the same complex through an agency. They paid more and did not have the amenities (chairs, cooler, towels) that we did. I loved the full size washer & dryer. My "kids" are 15 to 20 years old. The loft provided additional privacy that made if feel more like a 3 bedroom condo than a 2 bedroom, definitely worth the extra $$$ to open it up. There are restaurants within beach walking distance but far away from the crowds. Really one of the nicest vacations our family has taken. Had a fun-filled family reunion in St. Augustine. 2 sons in their late teens / early twenties flying in from their places of study / work to join parents and one teenage brother. The condo`s location with its great beach access was perfectly suited for the cause. Good WiFi and satellite TV helped everyone to stay on top of events at home, the well-equipped kitchen allowed for lots of family talk over home-cooked dinners which we enjoyed at the spacious dining table. Would like to come again. The 2nd floor condo is a very nice unit and is in a fine location re the beach.... well maintained and clean; nice supply of kitchen equipment. The kids loved the loft sleeping. And I like that the decorating was NOT an overload of in-your-face beachy knick-knacks, as some other of our beach rentals have been. Enjoyed it; thanks. Orlando, Walt Disney World, Universal Studios and Sea World just 90 minutes away, 12 nearby golf courses, Huge outlet mall 15 minutes away. Owner provides booklet w/ information on area attractions & activities, boat rentals, as well as maps, restaurant recommendations & menus. Deposit of $200 required to secure dates. Returned minus $90 cleaning fee ($100 if loft used) provided no damage. There is a 2% fee for credit card payment of rental amount (no fee for $200 deposit).